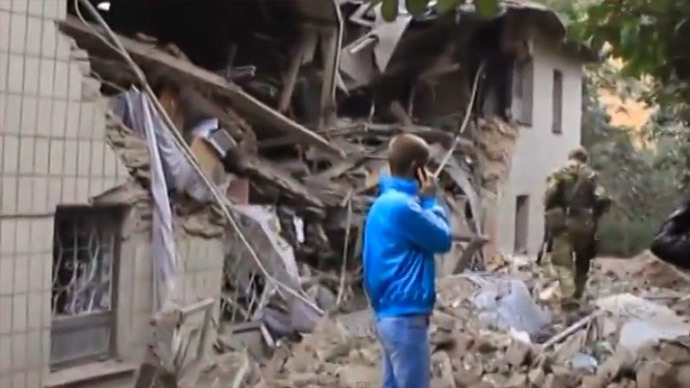 A heavy firefight is underway in a section of the city of Donetsk, with cannonade heard downtown. Self-defense forces report pro-Kiev armored vehicles and infantry trying to cut through defenses next to the central railway terminal. Ukrainian troops equipped with tanks and armored vehicles are attempting to break into Donetsk, a city of approximately 950,000 people, an official of the rebels' self-proclaimed Donetsk People's Republic, Sergey Kavtaradze, informed Reuters. The fighting is occurring in several spots simultaneously. The heaviest fire is heard near the Donetsk Airport, currently held by pro-Kiev forces and next to the main railway station, which suffered an airstrike this morning. 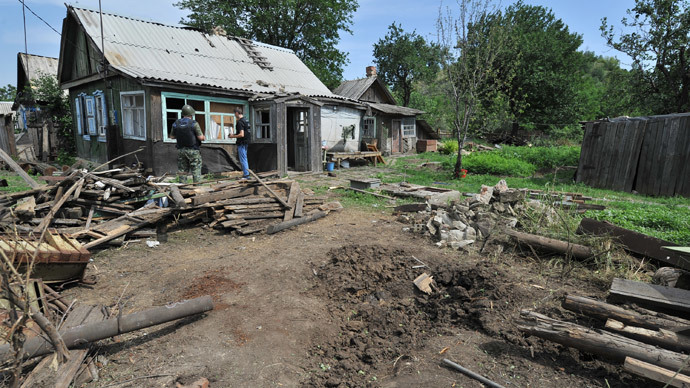 Minister of Defense of People’s Republic of Donetsk Igor Strelkov has informed Novorossiya news agency that units of Ukrainian army launched attacks against communities of Avdeevka, Peski, Karlovka and Netailovo. “The advancing tanks and motorized infantry on APCs are supported by artillery, howitzers and multiple launch rocket systems. 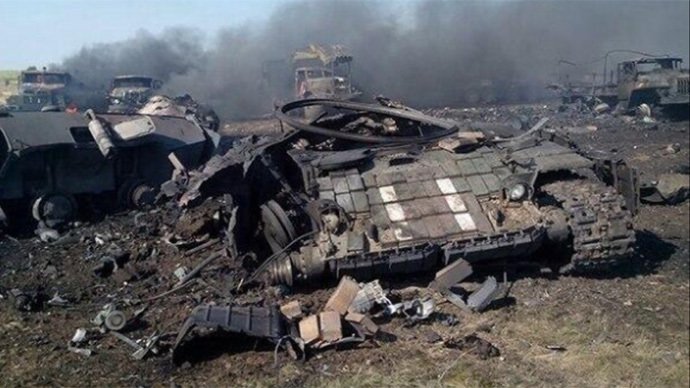 We’re fighting a battle,” Strelkov said. The city is being shelled with heavy artillery and unguided missiles of multiple launch rocket systems. 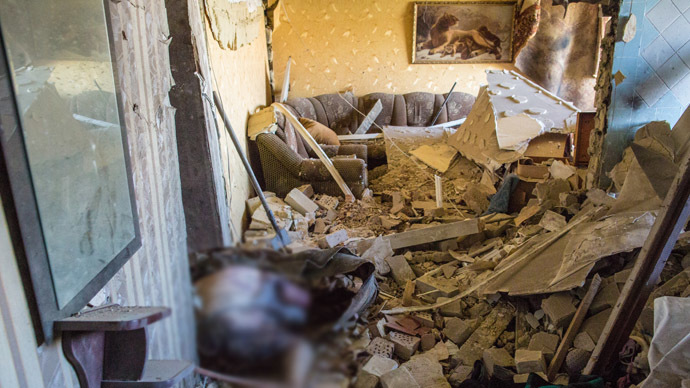 Victoria, a resident of Donetsk, heard explosions when she went to the railway station to meet her parents: “I arrived at the railway station at 9 a.m. approximately, saw my parents, we exchanged a couple of phrases – and then explosions burst out. We ran away to the bus to get away from there as fast as we could”. There was a group of military at the site – self-defence forces were telling people to leave. While on the bus, Victoria heard another series of explosions and saw people running in panic. According to eye-witnesses, shooting was heard near the railway station, it is a habitable area with a market, private houses and multi-storey buildings, and she felt the ground shaking and saw smoke. 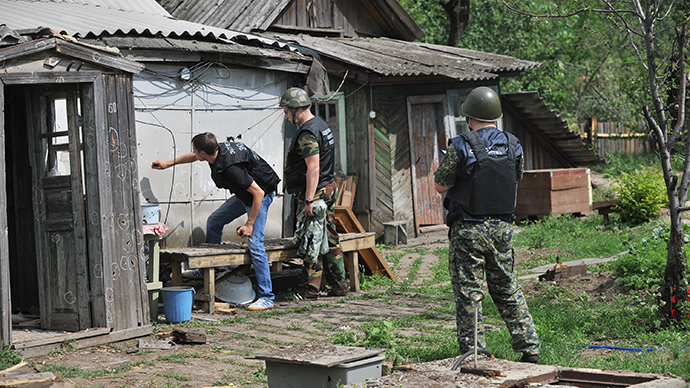 “The active phase of the anti-terrorist operation is continuing. 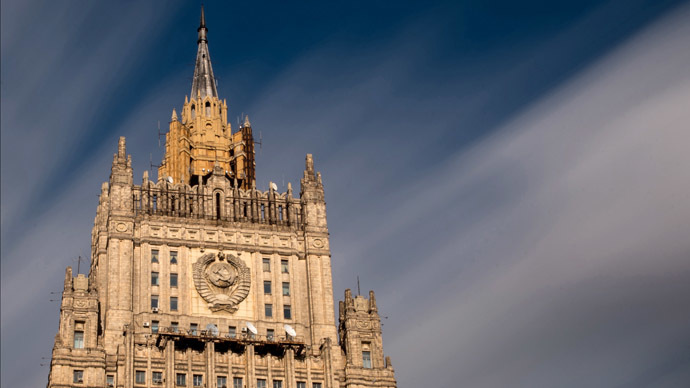 We are not about to announce any troop movements,” the spokesman for Kiev's military operations in eastern Ukraine, Vladyslav Seleznyov, announced on Monday. 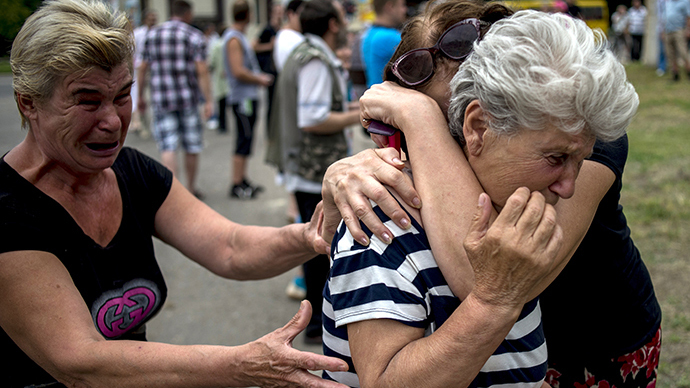 While Ukrainian President Petro Poroshenko ordered a ceasefire within a radius of 40km from the crash site of Malaysian Airways flight MH17 in Donetsk Region, the assault on the city of Donetsk itself continues. It is situated some 70km from the scene. At the same time spokesman for Ukraine's Security Council claimed that Ukrainian army is in no way responsible for explosions in downtown Donetsk that occurred on Monday. “There is work on clearing approaches to the city, on destroying checkpoints of the terrorists. If there are explosions in the middle of the city - then it is not Ukrainian soldiers," Andrey Lysenko told a news conference. The spokesman admitted, though, that the blasts could be a result of subversive operations. “We have strict orders not to use airstrikes and artillery in the city. If there is fighting in the city, we have information that there is a small self-organized group who are fighting with the terrorists,” he said. The city of Donetsk has effectively been under siege for days now and all supplies from central Ukraine have been suspended. There is no shortage of food in the shops so far, but stocks are expected to dwindle. The same applies to medical supplies in local drugstores. The worst situation is in Kuibyshev district, where all shops and firms have discontinued operations and mobile network is down. There’ve been reports about water shortage in certain districts of the city. 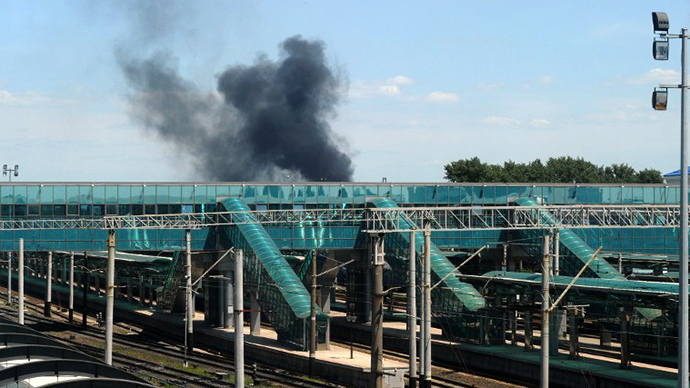 This morning reportedly six unguided missiles fired from Ukrainian fighter bomber exploded at Donetsk railway terminal, killing three civilians and injuring at least one. Blogger Christian Malaparte who is in Donetsk right now monitoring the ongoing battle for the city confirmed to RT that the Ukrainian army continues to shell the zone around the railway terminal with mortars. 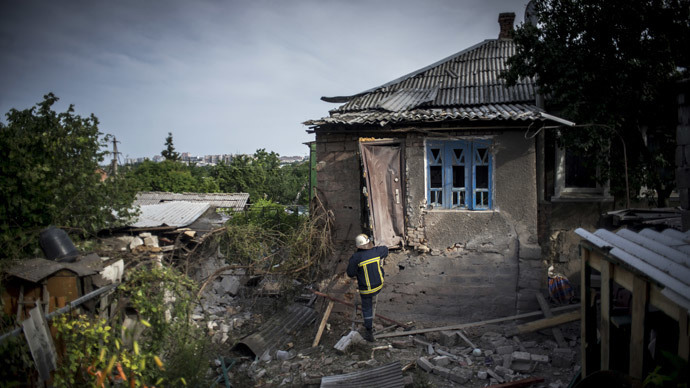 Because the pro-government forces in Donetsk are not advancing further right now, Malaparte sees only one reason for the continuation of shelling of the living quarters: to terrorize the populace of the city. 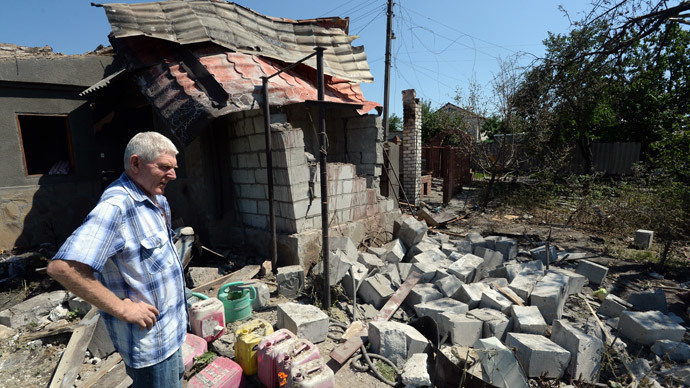 Many citizens of Donetsk have already moved to improvised bomb shelters in cellars of the buildings. Despite the damage caused to the railways and terminal building, the trains continue to operate, yet the ticket office in the terminal is closed and passengers have to board the trains as free riders. The Donetsk mayor’s office has addressed all citizens to stay at home and do not leave apartments without real need.